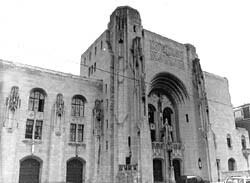 The Masonic Temple and Scottish Rite Cathedral is significant as an example of the work of Raymond M. Hood (1881-1934), a prominent architect of the 1920s and early 1930s, and as a unique example of Neo-Gothic architecture in Scranton. Raymond Hood's productive career spanned from 1922, when he and a collaborator won the Chicago Tribune design competition, to his untimely death at 53 in 1934. Hood became a nationally prominent architect trained in the Beaux Arts tradition and proficient with historic styles. 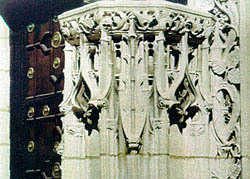 During those 12 years, Hood was the principle designer or primary collaborator in a number of high-profile progressive skyscraper designs, mainly in New York City, where he designed the Daily News Building and the McGraw-Hill Building in mid-town Manhattan, and was part of the team that designed Rockefeller Center. The Masonic Temple and Scottish Rite Cathedral is located on North Washington Avenue in downtown Scranton. The 1930 temple-cathedral is a highly stylized Neo-Gothic and Romanesque pastiche executed by Hood. The design of the building was to be a monument to Masonry. Masonic lodges in Scranton for years felt the need for a suitable home or temple, and prior to the construction of this building they used an old armory. Bids for construction were taken in January, 1927. The Masonic Temple and Scottish Rite Cathedral was inaugurated on January 2, 1930 when the first meeting was held in the building. The rectangular plan building is clad in coursed ashlar Indiana limestone supported by a structural steel framework. The front (west) facade is divided into three sections: the central and southern sections consist of five stories and the northern section consists of three stories. The temple-cathedral includes an auditorium and ballroom that are available to the Scranton community for various functions. The Center hosts a number of artists and programs, from local to international, as well as Arts in Education courses for all ages. Regular performances include The Broadway Theater of Northeast PA, Scranton Community Concerts, the Northeast Philharmonic and the resident theater company, TNT. The Masonic Temple and Scottish Rite Cathedral is located on 416-420 North Washington Ave. in Scranton. People interested in touring the Masonic Temple can join "A Day at the Cultural Center" which includes various activities and the tour. There is a fee. Visit the Center's website or call 570-346-7369 ext. 102 for further information.